Standing in the Chiang Mai airport, Chad looks at me, “Leslie, did you remember their old passports?” I answered, “Their old passports? No. Why?…. Oh no! Did you remember them?” Blood drained from both of our faces as we realized we didn’t have the kids’ visas for India in their new passports. We know to travel with old passports due to visas. How many times have we done this? We found the copies of their old passports and visas on the computer. Surely, they will see these and since they are minors let them go on through??? Well, no, after 90 minutes of trying out our best negotiation skills in the land of the smiles and quiet, controlled voices, we begged them to at least let us fly to India and only I would go through. Please. Please. Please. No. No. No. So with our exhausted kids we reclaimed luggage (lots of supplies for Voice for the Voiceless). As if on cue, stomachs in the family got sick, and our four year old got a headache. Rearrangements of flights began to take place. In India (my family went on to Nepal), I spoke to over 100 young women of different faiths for National Day for the Girl Child in India. All the girls were from the slums, and I learned that the majority lived in unsafe conditions in their families – beaten and hurt by dads and brothers. Most had never heard the Gospel. Young and vulnerable, forgotten by the world. Over 100 million females are missing in the world – their contributions they could have given the world forgotten. Forgotten visas are discouraging. But forgotten people is tragic. Will the church arise to the forgotten peoples? I sat with our twenty-two girls from abusive situations in the Arise Home. I listened as our partners shared with me the intense struggles they are having with the government since they are believers. The government tries to force them to place idols in the home. They continue to refuse. We sat around the table with lollipops and Little Debbie Valentine hearts I and the kids chose for them. With delighted smiles and laughter, we connected deeply. “What is your dream?” One young girl, recently hurt by her step father on a trip home (our partners are required to let them visit home) said with no hesitation, “I wish to be changed.” I saw within her eyes something flash – shame and yet hope. As I looked at faces and lives broken, yet healing, from horrible abuse, my heart groaned in mourning. I tried to capture their faces and our connection with my camera, but just as I was taking the photos, my camera broke. Broken cameras are frustrating. A broken life is tragic. Yet 1 in 3 women in the world is abused in some form at some point in her life. Will the church arise to the broken? Soon after that meeting, I looked for my phone and could find it nowhere! It was in my hand and then somehow lost. Lost items are frustrating. But lost souls are tragic. 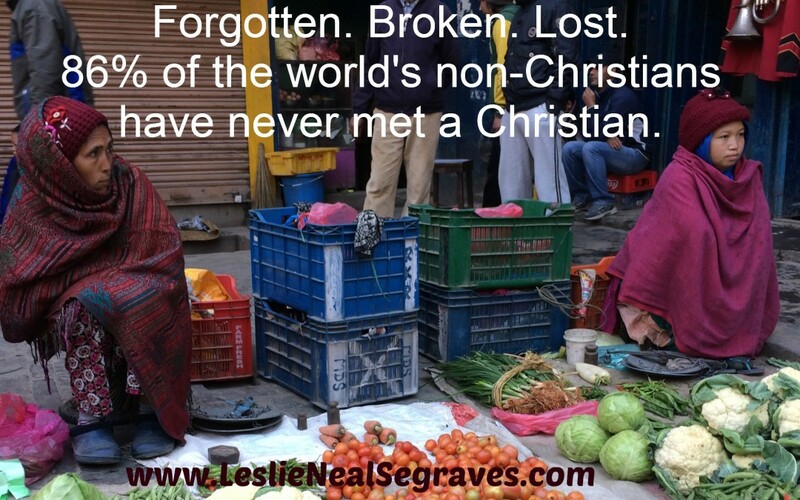 Over 6000 groups are considered unreached in the world. Over 86% of non-Christians do not know a Christian to share the Gospel with them. Will the Church arise to the lost world? I must say that I was frustrated and discouraged at times about forgotten visas, broken cameras, and the lost phone. But it pails in comparison (really, it’s no comparison at all) to being a person who is forgotten, broken, or lost. I am not forgotten (but remembered by Jesus). I am not broken (but healed by Jesus). I am not lost (but found by Jesus). Yet, millions are forgotten, broken, and lost. This tragedy can change to hope if the Church continues to rise and respond with passion, sacrifice, and commitment. Let’s remember, mend, and find through Jesus Christ!